When anyone mentions the name Frank Herbert most people will instantly think of Dune, a novel that has achieved an incredible success but also overshadowed anything else Herbert created since (Dune was only his second published full novel). It must have been a frustration that none of his works after Dune got anything like the success, despite some his his later work being superior in many ways. One of the reason's for this is probably due to the fact that most people read Dune first and then expect Herberts other works to be similar in style and here people will be disappointed. Dune wasn't written in Herbert's typical style and is quite different to anything else he has written before or since (with the exception of the Dune sequels). Hellstrom's Hive is a good example of this, taken on face value the novel is just as good a novel as Dune (if not better) but differs incredibly in style to the former work. The edition reviewed here is part of Gollancz excellent SF Masterworks series and includes an introduction by Adam Roberts. I don't usually read introductions before I read the main novel as many contain a little too much information about the forthcoming story, sometimes with spoilers even however having a lot of respect for Roberts work I took a chance and found it not only refreshingly limited to the information given away but also highly entertaining. Published in the year I was born, the story itself was inspired by a quasi-documentary film called The Hellstrom Chronicle which depicted the Darwinian struggle for survival between humans and insects. Set within an alternative USA with a tightly controlled police state - an undercover agency discover that a top secret experiment known only as "Project 40" - run by Dr. Hellstrom - is really a cover for a secret laboratory where a sect model themselves on the behaviour of social insects. Herbert does an incredible job of creating an alien insect atmosphere that is blended with human physiology with the end result that is quite striking - if you have any form of aversion to insects whatsoever it does make you just a little uncomfortable. This is re-enforced by the fact that by their very nature insects appear quite alien to us in many respects. 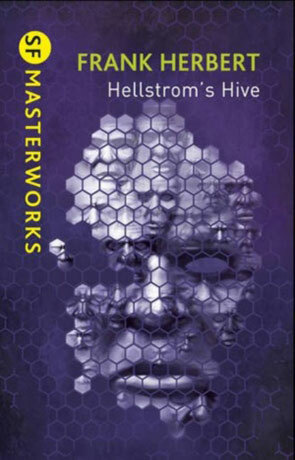 Hellstrom's Hive is a pretty unique piece of fiction, powerful and reflective, you may never look at an insect in quite the same way again. Written on 26th August 2011 by Ant.